It’s been a very exciting week this week, and it’s a great feeling to close the week with another Good News Friday installment. Besides the actual news of Trump’s speech recognizing Jerusalem as Israel’s capital, the timing should be noted too. The speech took place just a day after the 69th anniversary of Israel’s first Prime Minister David Ben Gurion’s announcement of Jerusalem as the capital of Israel – 5th December 1949. Chabadniks (Lubavitcher Hassidim) will assure us that the timing was perfect for another reason. The speech took place on 19th Kislev, the date that the original Lubavitcher Rebbe was released from the Tsar’s prison, and from that year on, the date is a great festival for Chabad. So in May 1947, less than two years after its inception, the United Nations formed the Special Commission on Palestine to propose paths forward for that region. Now to be clear: Israel needed no resolution to exist, for Israel’s right to exist is self-evident and timeless. They turned the desert into a garden, scarcity into plenty, and an age-old dream into a reality. And their striving and their sacrifice laid the foundation for what took place in this hall 70 years ago. While Israel was built by human hands, it’s impossible not to see the hand of heaven leading its people, writing their history in the restoration of this ancient people to their land of their birth. The quoting of prophet Isaiah is fantastic. If you want to understand how important that passage of Isaiah is relating to the rebuilding of Israel, Rabbi Lord Sacks wrote an extensive commentary. We’d expect nothing less from such a deeply religious mensch as Mike Pence, so it stands out dramatically as different from pretty much everything we’ve seen for almost a decade coming out of the USA. Read the rest of the article – it’s excellent. Turning now to a completely different subject, the following story demonstrates Israel’s care and concern for its neighbours in the entire region, even for its enemies, which Trump and Pence described so well (and which the antisemites deny or twist the facts about). The Israel Defense Forces has equipped a new maternity clinic over the border in Syria, as part of its Operation Good Neighbor instituted a year and a half ago to provide medical, infrastructural and civilian aid to Syrian victims of the ongoing civil war. The clinic is staffed entirely by Syrian healthcare workers using equipment donated by the Israelis. More than 200 pregnant women so far have sought medical care at the new clinic, and 30 women have given birth there. 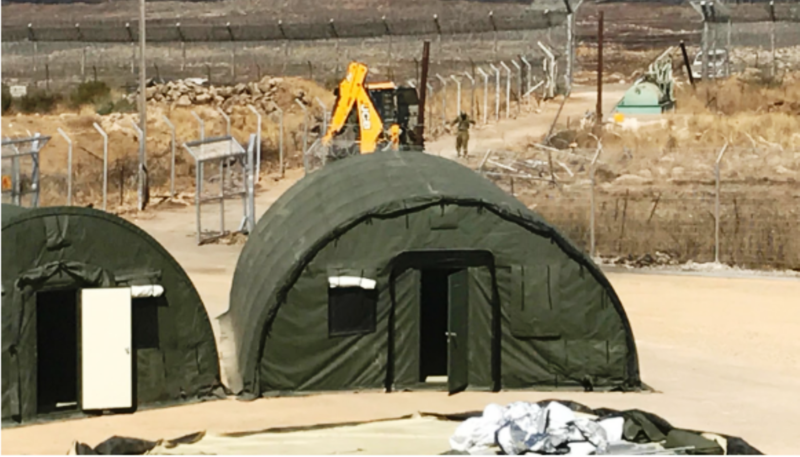 Last September, the IDF set up a secure field hospital, Mazor Ladach (literally, Bandaging Those in Need) on an unused Israeli military post in the southern Golan Heights. The Israeli staff has cared for hundreds of Syrians already, according to the Operation Good Neighbor commander. I am so proud of our crazy little country! Kol hakavod is to mild a term to salute the IDF and its medical teams as well as the government authorities who worked towards providing this urgent medical care for the civilians of our enemies. Hopefully these actions will change attitudes (they are already) and make new friends out of our potential enemies. And one more item from Israel’s medical sector. An extraordinary story of Mark Lewis, a British Jew who was suffering from multiple sclerosis (MS) and underwent successful stem cell treatment in Hadassah Hospital in Jerusalem has been made into a UK Channel 4 TV documentary. A prominent Jewish lawyer has taken part in a ground-breaking clinical trial at Israel’s Hadassah hospital that offers treatment which could finally offer a “miraculous” cure for the 2.5 million sufferers of multiple-sclerosis. Mark Lewis — best known as the media lawyer who took on Rupert Murdoch over the newspaper phone-hacking scandal — is one of 48 patients to have participated in the revolutionary year-long trial at the internationally renowned hospital in Jerusalem. At the Israeli hospital, Mr Lewis was injected with stem cells derived from his own bone marrow, directly into the spinal fluid. Speaking to the JC before a Channel 4 documentary this week about his treatment, he said he had benefited immediately afterwards from “a miraculous 60 per cent improvement in my condition”. Mr Lewis praised the pioneering Israeli technology used by the multi-faith medical team at the university hospital at Ein Kerem. “The trial is the complete antithesis to BDS,” he said. “It is Israeli technology treating everybody with a team that has no concept of religion, nationality or whatever. Mr Lewis said the sense of unity among the medical team was striking. “The leading professor was born in Greece and is Christian but is now an Israeli citizen. There was a Muslim doctor, there was someone from the former Soviet Union and there was a specialist who is the sister of someone known to be an Israeli ‘settler’. Research into the treatment’s efficacy for MS patients began at the Hadassah in 2007. It was one of the first experiments in which advances in stem cell treatments were applied to neurological diseases. By a stroke of luck, Mr Lewis was holidaying in Israel nine years later when he heard from a friend that the hospital was seeking patients for the full-time trial. Since being diagnosed with MS, Mr Lewis’s symptoms have grown progressively worse and he feared he would have to give up work within a few years. His life expectancy was put at just 65 years. Mr Lewis said the first thing he did on flying out to Israel to begin the trial was to visit the Kotel to say prayers. The treatment is extremely painful for the patient. In order to be injected directly into the spinal fluid doctors insert the needle, which is four inches long, between the patient’s vertebrae. The patient’s own bone-marrow stem cells are first extracted, then enhanced and then injected into the spinal cord. Each patient then undergoes monthly neurological evaluations including MRI scans and techniques to detect neuro-regeneration. In addition, electrophysiological and visual tests are performed of patients’ brains with up to five complete neuro-cognitive evaluations performed for each patient. Professor Karussis Dimitrios, Hadassah’s internationally renowned neuroimmunologist, will then write a report on the results allowing other medical facilities around the world to use the findings. Mr Lewis says that some of the initial positive responses to the treatment have now began to fade and he believes another shot of injections would bring similar benefits. “Think of it in the same way as if you were suffering from diabetes. You wouldn’t just be given one insulin shot and then told you were finished being treated. Kol hakavod to Professor Karussis Dimitrios and the entire research team at Hadassah Hospital for discovering and implementing this treatment. May Mark Lewis have a full and speedy recovery, refuah shlema, and may all the other countless sufferers of MS benefit from this treatment too. On this optimistic note, I wish you all Shabbat Shalom. This week we celebrate the first days of Chanukah, so I wish you all Happy Chanukah, חג אורים שמח as well!